Home / Travel / Travel Tips / How bad is the smog in Santiago? How bad is the smog in Santiago? Chile’s capital city, Santiago, is well known for smog. Why is Santiago so plagued by smog? It is Chile’s largest city with the accompanying industry and transportation-related air pollution. This pollution is made worse by the inversion created since Santiago sits in a valley between the Andes and the coastal mountain range. Just how bad does the smog get? Chile’s Ministry of Transport and Telecommunications shows the quality of the Santiago air on any given day via their website. Particularly in the winter months, Santiago seems to be under a blanket of smog. You can’t see the mountains which tower over the city. If you climb up a hill in downtown (like San Cristobol or Santa Lucia), the city seems to disappear into the smoggy horizon. The government recognizes the smog problem but things don’t seem to be getting better. One of the ways Santiago is trying to curb the pollution and smog problem is by restricting the number of vehicles driving in the city on any given day. Santiago has had vehicular restrictions for years. Not only is the smog unsightly, but you’ll probably notice some health issues if you are in Santiago long term. While I was living in Santiago, I seemed to have a persistent cough that never seemed to get better until I left the city. Since the rain will clean out the air and erase the smog for a few days, your best chance for clear viewing (and fresh air) is after a rainstorm. 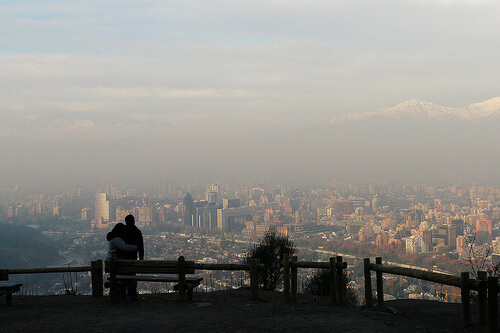 Smog is a part of life in Santiago so if you experience it during your time in the city, consider it a rite of passage. Es tan dificil encontrar un FAX publico en Santiago?